An illustration shows a proposed "Star Wars"-themed land to be built at Disney Parks. The faraway "Star Wars" galaxy will soon be close enough to visit. "Star Wars"-themed lands will be added to the Disneyland and Walt Disney World resorts — located in Anaheim, California, and Orlando, Florida, respectively — Walt Disney Co. representatives announced at the D23 Expo 2015 over the weekend. Both resorts will be expanded by 14 acres (5.7 hectares) to accommodate the "Star Wars" additions. "We are creating a jaw-dropping new world that represents our largest single themed-land expansion ever," Walt Disney Co. Chairman and CEO Bob Iger said in a statement. "These new lands at Disneyland and Walt Disney World will transport guests to a whole new 'Star Wars' planet, including an epic 'Star Wars' adventure that puts you in the middle of a climactic battle between the First Order and the Resistance." 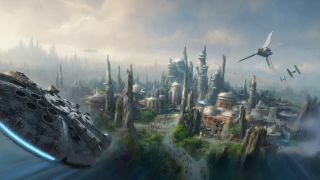 The new "Star Wars" lands will also allow park visitors to pilot Han Solo's spaceship, the Millennium Falcon, on a secret mission, company representatives said. No opening date for the lands was given. The collaboration between Disney and Lucasfilm — the California-based production company that was founded in 1971 by George Lucas, creator of the "Star Wars" movie franchise — goes back to 1987, when the "Star Wars"-inspired attraction Star Tours opened at Disneyland. Disney acquired Lucasfilm in 2005. Six "Star Wars" films have been released to date, with the first appearing in 1977 and the most recent in 2005 (not counting the 2008 spinoff "Star Wars: The Clone Wars"). The seventh movie in the series, "Star Wars: The Force Awakens" hits theaters this December.